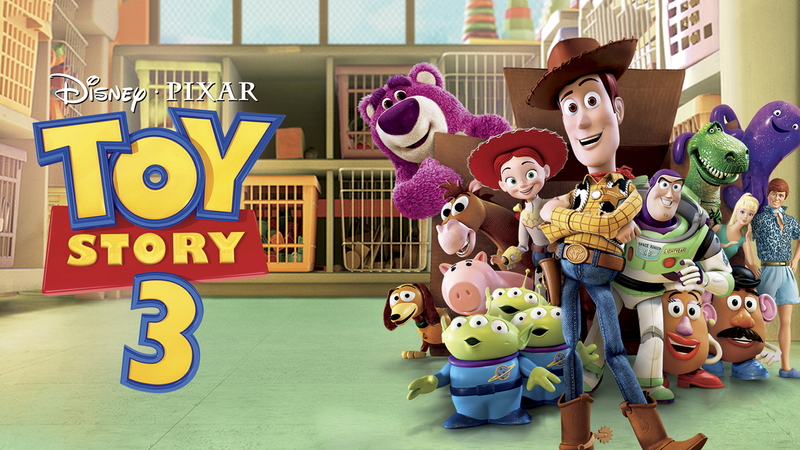 Toy Story 3 – The most disturbing entry so far in this franchise was originally intended to serve as a finale, but now they’re making a fourth one. Anyway, this starts out years after the last one, when Andy, who hasn’t played with his toys in years, is packing for college. He tries to put the toys in the attic, but when they accidentally almost get thrown away, they instead choose to donate themselves to a local day care. At first, the prospect of there always being kids there to play with them is exciting, but they soon come to realize that they’re confined to a room with toddlers who play really rough. Enforcing this is the leader of the day care toys, Lots-o-Huggin’ Bear, or Lotso for short. He initially comes across as very friendly and folksy, but it’s all an act. He’s pretty similar to Stinky Pete from Toy Story 2 in that respect, as well as in how it’s later revealed that he became nasty because he was abandoned, although his behavior is even more extreme. When the day care director’s daughter Bonnie takes Woody home, he learns from Chuckles the Clown, one of Lotso’s old companions, how much trouble his friends are in, and returns to the day care center to help them escape. Woody confronts Lotso about lying to another fellow toy from his old home, the rather creepy Big Baby, who turns against the bear and throws him away. He drags Andy’s toys down with him, though, and they’re all almost crushed or incinerated at the garbage dump. Woody saves Lotso’s life, but the teddy bear still backstabs them in the end. He’s discovered by a truck driver who had that kind of bear as a kid, and ends up catching flies on the front of the truck. When the toys do get away with the help of the three claw machine aliens, Woody writes a note (which, as far as I could tell, we never actually get to read) convincing him to give them to Bonnie. I’d say this is a happy ending, except we never do learn the fates of some of Andy’s toys who were already sold or given away, including Bo Peep. I read that they didn’t want to include her because there’s no way a porcelain doll would survive getting anywhere close to an incinerator, but it seems to me they could have written around that somehow. She is apparently supposed to reappear in the fourth film, but I’m not sure about Wheezy or the Etch-a-Sketch. I wonder if they’re going to get a replacement for Don Rickles as Mr. Potato Head; they already did get one for Jim Varney as Slinky Dog. R. Lee Ermey has died since this movie came out, too, but his part was much smaller. This movie made interesting and often amusing, if sometimes confusing, new developments with some of the toys. When Mrs. Potato Head loses an eye in Andy’s room, she’s able to see what’s going on there even when she’s nowhere close by covering her other eye. Mr. Potato Head is able to function when he puts his body parts on a tortilla and a cucumber, perhaps a reference to how the toy was originally intended for use with an actual potato before they started just including a plastic one. (You know, we had a Mr. Potato Head, and the arms were not removable and a pair of eyes was a single unit. Has that changed, or are we just supposed to suspend disbelief?) Lotso’s gang gets Buzz Lightyear to work for them by changing his settings to demo mode, which reverts him to his original personality of thinking he really is a Space Ranger. When the other toys try to reset him, they temporarily activate his Spanish language mode, which has the side effect of making him an amorous salsa dancer. Barbie’s role is expanded quite a bit, as she and the Ken doll who’s one of Lotso’s henchmen immediately fall for each other. She takes advantage of this to free her friends, but Ken eventually does have a true change of heart. He’s portrayed as rather effeminate, as per his status as a male toy marketed for girls. 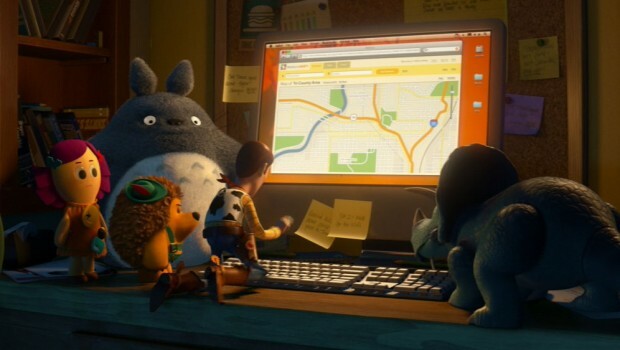 I thought it was cool that Bonnie had a stuffed Totoro, although I don’t think he had any lines. And it was pretty sad seeing Buster, the dog from the previous movie, as old in this one. This entry was posted in Cartoons, Humor, Revisiting Disney, Toys, VoVat Goes to the Movies and tagged barbie, bo peep, buzz lightyear, dogs, dolls, don rickles, jim varney, ken, lots-o-huggin' bear, mr. potato head, mrs. potato head, pixar, r. lee ermey, totoro, toy story, toy story 2, toy story 3, woody. Bookmark the permalink. I know I’m not alone when say that I watched this movie for the first time, I legitimately thought for a moment that they might really end it by killing off the characters. But now it kind of feels like Toy Story will just keep going forever. Like a number of people probably are, I’m nervous that a fourth Toy Story could diminish what was a nearly perfect trilogy. Well, the Toy Story franchise has already carried on past the end of that movie with a handful of pretty good shorts and specials, so maybe I should have more faith in Pixar, but the trepidation is understandable considering other film series that a lot of fans think should have quit after the third movie, like Indiana Jones and Star Wars. What’s Toy Story 6 going to be about? Bonnie goes off to college and Woody and the gang have to go through the same crap all over again? I was actually okay with Bo Peep being absent from the third movie and would almost prefer it if we never saw her again. I didn’t dislike her, but she was always the least interesting character, plus making her a fragile figurine was a somewhat unfortunate choice because it really limited how much she could do. All that aside, though, her being gone with no explanation just made the situation feel even more real and fraught and tragic. By leaving her fate ambiguous, I guess they were leaving a window open to maybe bring her back in the future, but if they just track her down and bring her back like nothing happened, I worry it’ll feel cheap. I dunno, I didn’t need a sequel to Finding Nemo that was inspired by a quick joke from that movie and I’m not sure I need a sequel to Toy Story that’s all about finding out what happened to Bo Peep. It really does seem like the third movie was intended as a wrap-up and that making a fourth one would cheapen things. That doesn’t mean it won’t be good, though. There have been plenty of series that maintained quality after their creators tried to end them. I have seen statements that Pixar doesn’t want to do any more sequels, but if that’s true, it’s kind of too late because they’ve been cranking out so many. As for Bo Peep, I didn’t find her that interesting either, but giving her a more significant role could potentially MAKE her more interesting. I like the idea of her appearing in another movie, but I don’t want it to be about nothing BUT that.